Charlie Morton isn’t a very good pitcher. His career ERA is 5.38, he’s got fewer than half-again as many strikeouts as he does walks, and he went 2-12 with a 7.57 ERA in 2010. If I were Chuck, I’d look to shake things up a little bit. Well, it looks like he’s done just that. Morton, a third round pick of the Braves in 2002 and traded as part of the package that sent Nate McLouth to Atlanta in 2009, has changed his delivery. Not only that, he’s changed it to mimic a pretty familiar guy: Roy Halladay. Hey, if you can’t be as good, at least try what seems to work. To the right, we have a side-by-side comparison of still images from Morton’s May 18 start against Cincinnati (a complete game shutout) and Halladay’s May 20 start against Texas. 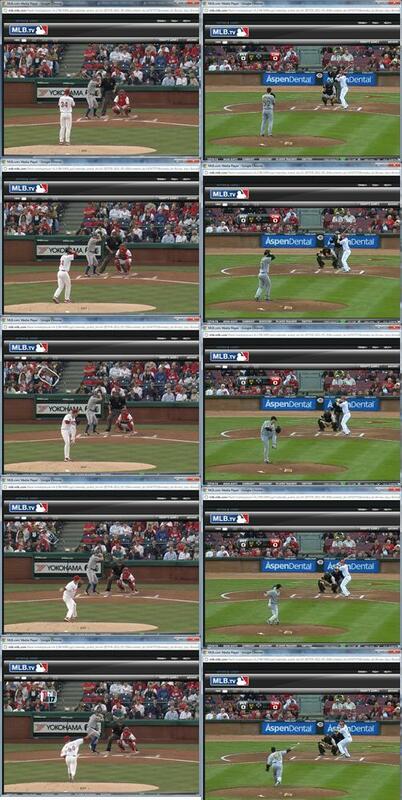 It’s a little busy, so forgive the assorted MLB.tv fragments for a second and focus on the similarities (with a bigger size here). Starting straight-up with the glove and ball chest-high, the first move in the wind-up is to bring ball and glove overhead with a short step back at about 45 degrees. Then, actually “winding up” by bringing ball and glove back chest-high while pushing off with the left leg and bringing it up starts to create torque. You can see that, while Morton’s hands are a bit farther from his body, the positioning is essentially the same. Both are primed and about ready to release the hip tension they’ve wound up from these similar positions. Opening up, both pitchers have the ball parallel to their shoulders as they plant, with shoulders up and gloves straight out in front with bent elbows. Then, at pitch release, the arm comes through a three-quarter slot and straight to the mitt. 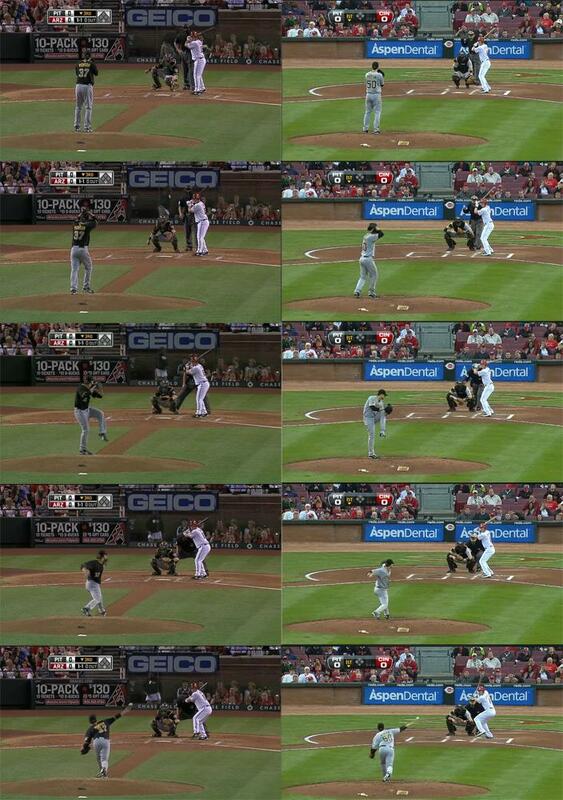 You can compare Morton’s 2011 delivery with his 2010 delivery in this picture. The building blocks for True Halladay Mimicry are there, but only this season has the imitation become absolute. This is by design. Now, this is to say nothing of Morton’s results. His stuff, while above average at times, still pales in comparison to Doc, and even with this new delivery Morton has managed only 29 strikeouts to 26 walks in 55 innings so far in 2011. Doc walked 30 batters in 250.2 innings in 2010. Really, this isn’t a way of saying Morton is about to be the next Halladay, but it’s sure neat that he wants to try. Really, Morton should be honored that Doc even allows this without demanding tribute or animal sacrifice. Phrontiersman does this sort of thing for a living, kind of. You can follow him on Twitter if you enjoy random facts about the Phils with occasional snark and Bobby Abreu white-knighting.